There is nothing like coming to Ely, MN and taking a guided fishing trip through the Boundary Waters. At Moose Track Adventures, we offer guided fishing trips that are sure to please the novice learner as well as the expert enthusiast. If you are looking to do a fishing trip in Ely, MN this summer, check out all that Moose Track Adventures has to offer. Every real fisherman knows that when you go out on the water, you aren’t always guaranteed a fish. No one can promise you that you’ll catch a fish that you’ll want to mount. Simply put, fishing doesn’t work like that. At Moose Track Adventures, we can’t make promises but we can certainly raise the odds of it happening. Our expert guides know these waters better than anyone in Ely, MN. They understand the ins and outs of fishing and are constantly learning more and more as they teach others about the history, native animals and general terrain. If you want to know the secrets of Ely and Boundary Waters fishing, our guides are your best bet! Let them take you to the perfect place to catch the fish that you’ve been hoping for. Our guides will put you in perfect position and even assist you with your casting. Reeling them in has never been more fun! 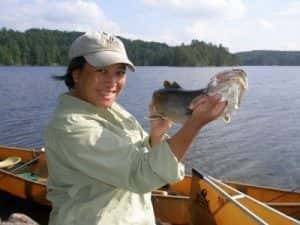 There are several guided fishing trips at Moose Track Adventures. Whether you are looking for a day trip or hope to take a two week fishing trip, we’ve got the resources and the guides to help you do it. Based on your wants and needs, our professional guides can take you where you want to go and make it a trip you’ll never forget. If you are ready for your next real adventure, consider a guided fishing trip at Moose Track Adventures. For more information or to book your guided fishing trip today, give us a call at 218-365-4106 or send us an email at info@moosetrackadventures.com.